"You know that feeling? That crawling feeling?" Farmer Warin was standing in front of the long table of Elders, his plump, wide-eyed wife at his side. Both had turned their backs to the Elders in favor of addressing the Gatstaf townsfolk gathered in the cramped parish commons. Halana looked on from the seat closest to the door, where she sat next to Alena. "It's like a beetle is crawling up the back of your neck." Warin shuddered as he spoke. "Right up from the base of it and straight into your hair." It was odd, Hal thought, that he should speak of that feeling now, today. She had never heard mention of such a thing before, never known such a sensation was possible, not until this very morning. She had woken with it, something ticking on the back of her neck, crawling up her spine. It had made her feel unsettled, which in itself was extremely peculiar. So the fact that the feeling, which had crept after her out of their bed at camp through the woods and into town, should be brought up again so soon after she first felt it was enough of a strangeness to dredge up another wave of it. She suppressed a shudder of her own. "It's so real that you have no choice but to wonder if something's really there, you know?" Farmer Warin itched the back of his neck furiously. Seeing him do so made Hal realize she was doing the same. She clasped both hands on her lap. "Something horrible could be burrowing under your skin and you'd never know it!" Many a townsfolk twitched and shifted in their seats, itching along with Farmer Warin. "Yes, yes," Elder Kolman waved his thick hand as though shooing away a fly. "We all know the feeling, Warin, but what's it got to do with why you've come here today before the council?" "Everything!" Farmer Warin turned back to face all eleven of the elders present—they were down from their usual twelve, as Elder Somlon was absent due to her performing the second day of death rites to see good Lady Mary into the Blessed Sleep. "That crawling feeling is how I know I'm right!" "Right about what, Warin?" Elder Kolman prompted. "Spit it out already!" Elder Glather hollered. "One of our cattle is possessed!" Farmer Warin's wife seemed unable to contain herself. "Gone mad! In the middle of the night. And it ate the other one! Dragged it all around the pasture first, though. I saw the tracks myself. The pain the poor animal must have endured. Then the mad one just devoured it. It left nothing behind but the bones and teeth." There were gasps from the townsfolk. "And how do you know that it was the first cow that ate the second?" Elder Kolman asked, feigning patience. "I saw the blood on its own snout this very morning!" Hal looked to Alena. Communication between them required no words. They both knew that the Warins' farm was situated at the edge of town. They both knew it abutted the woods of the Ulvenwald. And they both knew what beasts had, of late, made a fateful resurgence in their forest. In the span of a fortnight, Alena and Hal had each on their own dispatched three lycanthropes, and in addition, together they had taken out a whole pack—small, but certainly a pack—just the night before. But those encounters had all been far enough from Gatstaf to not raise concern, Hal having followed a distant howl halfway down the Bower Passage, and the one Alena had taken was out at the Natterknolls. But now their shared look said there was reason to believe the beasts had become brazen, that they were working their way to the fringes of the woods, to the towns, to the people. That was unacceptable. 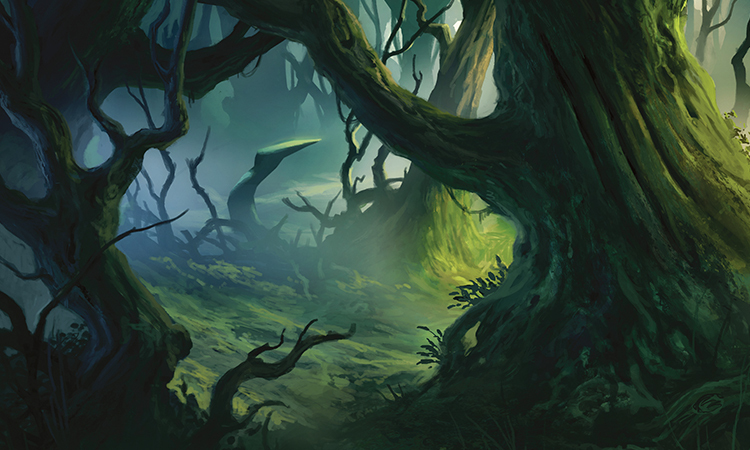 The Ulvenwald was Alena's and Hal's domain, and they would not let its dark horrors leak out to harm the innocent. "Our wards!" Wife Warin's wail drew Hal's attention back to the front of the room. "She made our shoddy wards!" The farmer's wife thrust an accusatory finger in the direction of good Lady Evelin, who gasped and clutched at the ward at her neck. "She made them, and they failed!" "It couldn't have been the wards!" The man seated at Evelin's side jumped up to her defense. "Lady Evelin makes the best and most potent wards this town, nay, this land, has ever seen!" "Order!" Elder Kolman shouted, pounding his thick flat hand on the table of elders. But he was ignored. "Then how do you explain the possessed cow?" Wife Warin challenged. "The tracks that show it dragged the other around our farm? The bones it left behind after feeding?" "Aye!" someone shouted from the back. "The wards didn't do their work," came another voice. "There can be no doubt, the wards failed, and our cow was possessed." 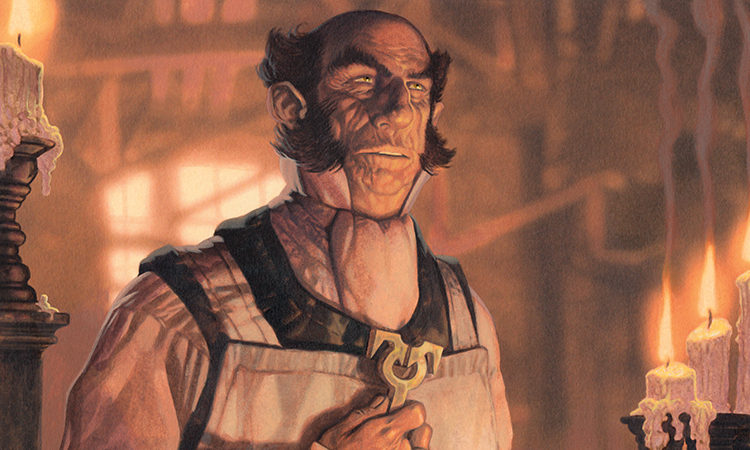 Farmer Warin seemed to have gathered courage to speak from the rallying of so many townsfolk to his cause. "We are the victims of Lady Evelin's neglect." He held tight to his own ward and beseeched both the townsfolk and the Elders. "We cannot afford to go one more night without a proper ward." There was a rabble of agreement. It made sense to Hal that the townsfolk would blame it on faulty wards. That they would think their cow possessed by an evil spirt. These were things they could define. These were things they had the means to put right. Things that did not upset the careful balance that they believed to govern their world. They did not live in the same reality that Hal and Alena did. The townsfolk didn't see what happened in the darkness, in the woods. They lived in a world protected by the light of the angel Avacyn. They believed themselves safe from things like werewolves. But even in Avacyn's world, the werewolves were never completely wiped out. Lycanthropes had had a constant presence in the Ulvenwald, significantly diminished though it was. Hal and Alena would know. They had heard the lycanthropes' unearthly howls echoing off the trees, a permanent fixture in the forest's deepest reaches. Thinking of their howls, Hal shifted uncomfortably in her chair; the crawling feeling returned to the back of her neck. A howl was what she had heard, what had brought on the unwelcome feeling in the first place. She had first thought she had dreamt it. The fight earlier that same night with the pack had been playing out in her dreams. It had been some time since she and Alena had faced a pack. It had also been some time since they had faced so many lycanthropes in such a short span. Hal had been seeing flashes of their muzzles, their muscles, their haunches in her mind as she had laid in bed, so she had not been surprised that she woke thinking that she had heard a howl. But now, looking at the bulging eyes of Wife Warin's face, she worried that the howl had not been in her head, had not been a memory nor a dream but the sound of a real and true beast. The very beast, in fact, that had dared to come into the town, had dared to feast on the Warins' domestic cattle. It would not be allowed to do so again. "Shall we?" Hal silently mouthed the invitation to Alena. Alena's face lit up, the glow of the hunt already upon her. Together they rose. Hal's fingers tingled in anticipation, her eyes on the handle of the nearby door—the door that in the next instant flew open. Innkeeper Shoran and his wife, Elsa, charged into the parish hall. "Ring the town bell!" Elsa cried. "She's gone," the innkeeper said. "She's dead!" Elsa amended. "He killed her!" Any order that Elder Kolman had succeeded in restoring in the last moments went out the window. The townsfolk howled and shrieked and jumped to their feet. "Oh, the poor girl," Elsa wailed. "The blood was all over. I can't imagine what he did with her body. I knew he was a depraved and wicked man, I knew it from the moment they came to the inn, from the moment they came to town." "The Palters," Hal whispered to Alena. It was obvious who the victim and accused were supposed to be: the Palters from Gavony. They were currently the only guests at the inn, the only guests the inn had seen in the last three months. 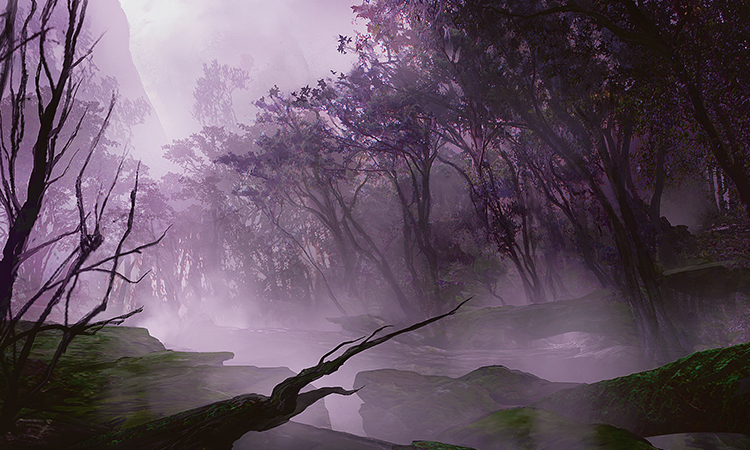 Hal and Alena had found the cathar and his wife themselves no more than a week ago, wandering the deep paths of the Ulvenwald up near Bower Passage. Of course Hal and Alena had helped them, of course they had seen the two out of the twisted wood and to Gatstaf, fighting off no fewer than three wolves, one ghoul, and a possessed oak on the way. Hal smiled at the memory of Alena's swift dispatching of the tree. The highly skilled tracker had improved her grappling skills so significantly over the past year that Hal wouldn't be surprised if she could take down a giant skaab without any sort of outside assistance. The Palters had thanked Hal and Alena in kind, or at least Mr. Palter had, for his wife had been so shocked by the trials of traversing the dark wood that her slender form had retreated entirely under the hood of her riding cloak. Mr. Palter, who explained he was a cathar of the Lunarch Council, insisted on giving Hal and Alena a token of protection, one that he had used many times, he claimed, to help him in his duty as guard of the mausoleum. Hal and Alena had taken the token politely, but it meant little to them, for they did not believe in the need for such things—not when they had each other. "Ring the bell!" Wife Shoran commanded once more. "There is a murderer on the loose in our town!" Hal would not have thought the Palters, either one, to be a murderer. The cathar was kindly, and his wife most obliging, if slightly fragile. Could it be that this too was the lycanthrope? It certainly seemed so. "Come on," Alena hissed, gesturing toward the door, which was no longer barricaded. The two innkeepers had moved farther into the fray, embraced by the folds of townsfolk who were hungry for further details of the gruesome happenings. Hal and Alena slipped easily through the crowd without drawing attention. They were well practiced at moving by stealth, and in two quick, lithe strides they were out the door and on the cobbled street. "Yes, or they," Hal amended. "This could have been the work of a pack. Another pack..." she mused. "That would make two packs that were in relatively close proximity in one night. That hasn't happened in some time." She cast a glance at Alena, who did not look back, so focused was she on their heading. "Either way," Hal went on, "the lone lycanthrope or the pack attacked within the boundaries of Gatstaf at least twice last night. Once the cow at the Warins' farm." "And once Mrs. Palter in the Shorans' inn." Hal abruptly halted in her tracks, and her hands flew to cover her gaping mouth. Her mind had just put something together. "What is it?" Alena asked over her shoulder. "It's shocking, to be sure." Hal hurried to catch up. "But where the townsfolk are far off in their assumption of the possessed cow, they are not so far off at all in properly identifying the one responsible for Mrs. Palter's murder." Alena cocked her head in question. "In the inn," Hal repeated Alena's own words back to her. "In the inn..." Alena said. Hal could see the work of her mind behind her eyes. "...In the Palters' room...behind a locked door." "With no mention of a broken window or forced entry," Hal said. As one, they changed course, running for the Shorans' inn. The tolling of the town bell continued, far past the point of being any useful sort of alarm. 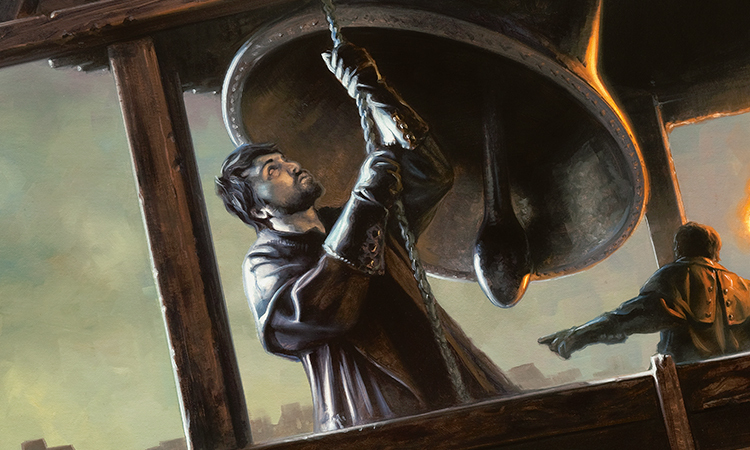 From the sound of it, Hal thought it likely that Elsa Shoran herself had come into possession of the rope, having most likely wrestled it from the hands of the bell-ringer. If that was the case, then all the better; the distraction Elsa was most likely providing to the Elders, who would be left, in turn, to wrestle the rope from her hands, would afford Hal and Alena more time to search the Palters' chambers. They made their way past the desk in the reception area and stalked down the hall. Hal nodded ahead to the only door that was left ajar, no doubt by the harried innkeeper and his wife after having witnessed the scene of a murder. Hal moved into the room first and Alena followed; neither disturbed the angle of the open door. The metallic scent of blood hit the back of Hal's throat on her first breath. "This way," she whispered, winding past a toppled chair in the small foyer and back toward the dimly lit bedroom. She sensed Alena tense. Though the candles were snuffed and the curtains drawn, there was enough light for them to see the pool of dark blood on the floor. Alena, Hal knew, had not tensed out of fear; she wasn't the kind of girl to become afraid at the sight of blood. The stillness was her way of focusing her senses. Hal had learned much of her own skill in tracking from studying Alena. She imitated Alena now, becoming motionless so that she could be more sensitive to the clues around her. Looking at the vast dark pool, her thoughts turned to the slight woman whose blood this was. Hal only let her mind dwell there for a moment, and for that moment she allowed herself to feel pain and pity for the woman. Mrs. Palter was an innocent who had lost her life to one she so trusted. Hal glanced up at Alena. How terrifying those last moments must have been. How awful the realization. But she could not dwell on the feelings of sorrow. It would do no good in the work they had to do next. Careful not to disturb so much as a drop of blood, Hal stalked the perimeter of the small, square room, moving about it clockwise as Alena moved in the opposite direction. Three clues presented themselves without hesitation: a torn bit of lace, a toppled candle lying in a puddle of its own hardened wax, and a silver button. It was the button that held Hal's attention. As she came round the perimeter to meet Alena again, she pointed to where it lay on the floor near the pool of blood. "Tell me if I am mistaken," she said. "But wasn't Cathar Palter wearing a green vest with three buttons just such as that one when we met him in the woods?" Alena's look was somber. "Your memory is accurate as always, I fear." "Then it is true," Hal said. "His transformation occurred in this room. He killed his own wife and then fled, through the Warins' farm, snacking again, and then into the woods." "Yes, so it seems," Alena said. But Hal could tell by her voice that she wasn't convinced, not entirely. "What is it?" Hal asked. "What has caught your eye?" Alena gestured to the pool of blood. 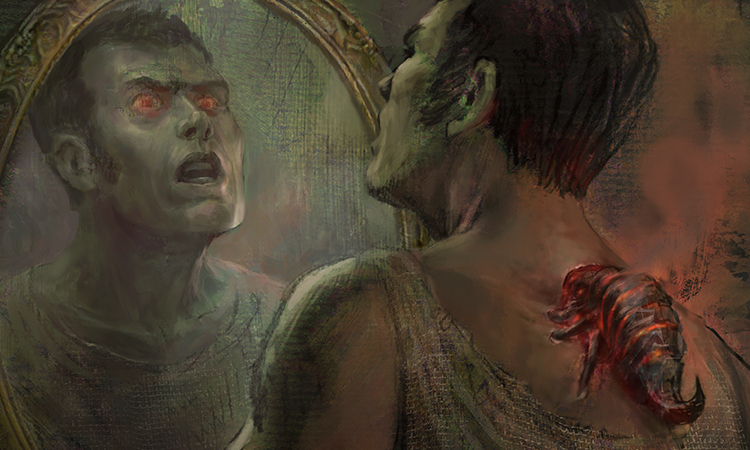 "I cannot help but wonder: the blood is here, so much of it on the floor, but what of the bones, the bits of flesh, the hair and fabric, the things the beast would not have devoured?" Hal stepped back, taking in the scene with fresh eyes. Alena's was an important question to ask. But before Hal's mind could settle into answering it, something else claimed her attention. Behind Alena, the door of the closet was cracked just enough for Hal to make out what was inside. At the sight, Hal's heart quickened. Alena noticed immediately. Her brow furrowed in question and she turned to look over her own shoulder. They both stood staring for a long moment. In the closet was a chair. It was an ordinary enough chair besides the fact that it was sitting in the closet. But that in itself wouldn't have been enough cause for concern, and that had not been what had sent Hal's heart to hammering in her chest. It was the leather straps and belts that hung from the chair, more than a dozen, of all lengths, ripped and shredded, that had given her pause. And there were three locks, one on the chair's seat and two on the floor. "That seals it then," Alena said. "Of course he did." Alena's voice was sharp. "We must stop him. We should—"
But she never finished her thought, because in one fluid motion Hal wrapped her arm around Alena's midsection, drawing the girl to her breast and pulling her into the shadows. Together they stood still and silent. They were so well practiced in this form of concealment that their breaths instinctively fell into sync, low and shallow, difficult even for the most astute of creatures to detect. It had been the silence that had alerted Hal. Or at least the lack of the clamoring noise, which had been sounding continuously up until that point. The bell was no longer ringing. That would mean that the murder investigation was on. The din of echoing footsteps and muffled voices confirmed it; the townsfolk were headed to the scene of the crime, to the very room where Hal and Alena were now pressed into the corner. The creaking of the door to the inn said to Hal and Alena that they could not go out the way they had come, at least not without needlessly rousing suspicion. As a rule, they avoided run-ins with the townsfolk whenever possible. The townsfolk tolerated Hal and Alena. They accepted the presence of the trackers in Gatstaf whenever the two came to town because they had aided visitors and townsfolk alike on their journeys through the Ulvenwald. But at the same time, the townsfolk knew that Hal and Alena lived in the dark woods, and for that reason they were considered "other." Glances were cast, suspicions shared in hushed voices, and prayers uttered in passing. Hal sensed as much fright as dislike on the scents of those to whom she came too near. It would do no good to be found at the scene of a murder. Alena nodded to the window in the back of the bedroom, the one that opened into the alley. Perfect. Hal smiled at Alena's ever-dependable adeptness at getting them out of tight situations. On their way out, Hal carefully and quietly closed the door to the closet. There was no reason for the townsfolk to see the thing that would so rattle and upset them. No point in stirring up such worry that would surely come with even the barest hint of the presence of a lycanthrope. The people need not believe they were being hunted, for they were not. Hal and Alena would handle this. They would protect the innocent. The Ulvenwald and its threats were for them to manage. And they would. They timed the opening of the window with the banging open of the outer door to the room. The sliding of wood over wood as they closed the window was then drowned out by the thumping of heavy boots and competing baritone voices as the Elders and other townsfolk flooded the room. Hal and Alena climbed down into the alley without any of the townsfolk being the wiser. They hadn't much time. The sun was already kissing the horizon when they arrived back at their camp deep in the Ulvenwald. Each quickly but deliberately strapped on her silver. Of course they always carried one small blade of it—it would be foolish to be completely unprepared—but until recent events there had seemed no need to carry more. Now they found both the need and means to carry nearly all of it with them: silver-tipped arrows, swords, spears, and daggers. The metal gleamed with power. As soon as they were equipped, they left their camp again. Moving as one, they navigated the maze of brambles Hal had planted around their home as a safety measure and pressed out into the darkening woods. Alena was first to pick up on Cathar Palter's trail. She was often the first to get a scent. Her nose, though petite and perfectly round in a way that set her whole face alight when she laughed, was also sharp and discerning. Her skill was well-honed. Hal found the scent only moments later, recognizing it from the room of the inn, and saw the boot prints an instant after that. Together they stalked the murderous lycanthrope. His tracks wound around the twisted trees, seeming to say either that he was lost, or more likely that he was struggling with himself, with the animal that he was inside. Hal imagined that same struggle was what had driven him to pick up his life and leave Gavony. He must have killed there. Most likely more than once. And when he had realized the horrors he had committed, he doubtless had no longer been able to face the people whose lives he had affected. So he had fled. It wasn't odd behavior. Not for a lycanthrope. What was stranger was bringing his wife along with him. The poor soul. Hal could not reconcile that behavior with the impression of kindness and compassion she had gotten from Mr. Palter when they had found the couple in the woods. She wished to give the cathar the benefit of the doubt. Perhaps he had intended to leave Mrs. Palter in the safety of a new town, away from any suspicions that might be cast her way because of his actions, somewhere that he could believe her to one day start anew and find happiness. Then maybe he planned to sequester himself to the wood, or worse. She imagined that's what she would do, if ever the curse was transmitted to her—perish the thought—she would not, she could not, put Alena in danger. She would leave. She would have no choice but to go very, very far away. And she would do so, all the while, knowing that her heart would never mend. Perhaps the act in itself would be enough to stop her heart from beating altogether. What a mercy that would be. If that is what Mr. Palter had tried to do, Hal felt nothing but the deepest sympathy for him. That is, until the next moment when she thought of Mrs. Palter's blood on the floor. Regardless of his intentions, Mr. Palter had failed the one he loved. He had not been strong enough, and his shortcoming had resulted in the end of her life. As though in response to Hal's shifting feelings toward the cathar, his tracks shifted too. It became clear when his transformation had taken place, for one moment Hal and Alena were following the boot prints of a man and the next they were tracking the paw prints of a beast. They moved along the lycanthrope's path until abruptly and unexpectedly they came to a crossroads. 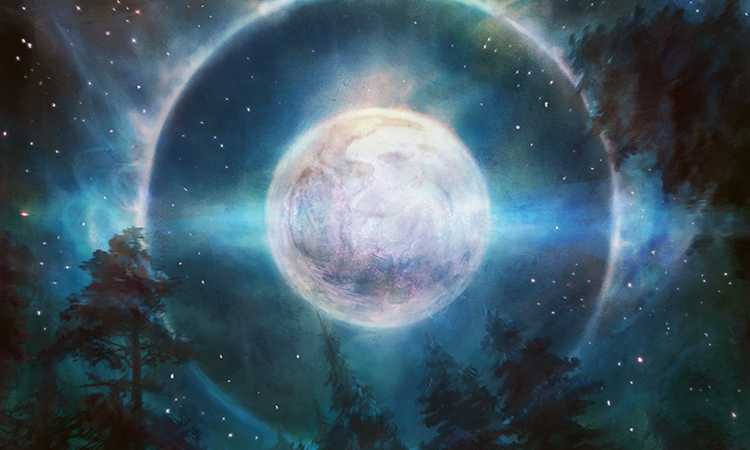 Hal and Alena eyed the split trail at their feet, visible thanks to the light of the silver moon. From the point where they stood, Cathar Palter had gone two different directions, surely at two different times. He must have gone one way first and then at some point, near or far from this point of intersection, it was hard to say, doubled back and gone the other. "East to Gatstaf or west to the deep woods," Alena said. "It seems our beast was fighting an inner struggle." Hal nodded. It did not surprise her that though she had not vocalized her theory, Alena's mind and landed in the same place. "So," Hal said. "Which way did he go first? Where is he now?" "Did he let his cravings drive him to town, and then at some point retreat?" Alena looked into to the wood. "Or did he try to overcome, only to be driven back to town by his cravings?" Hal looked to the town. "We have to—" Alena began. "Go to the town," Hal finished. The point at which the tracks emerged from the Ulvenwald was at the edge of the Warins' farm. That was unsurprising. 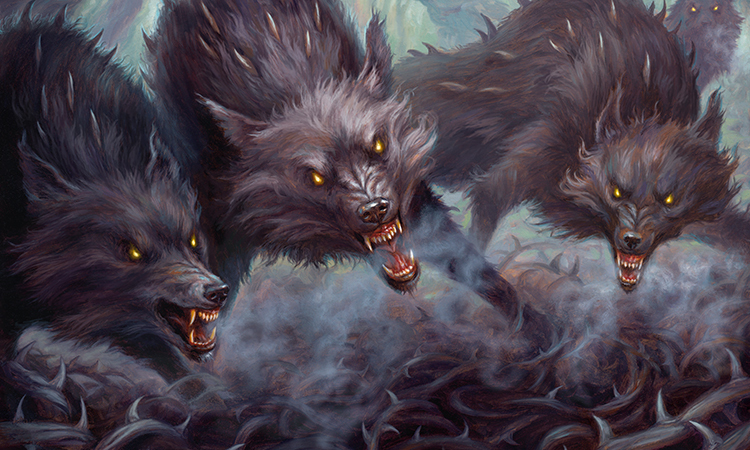 Lycanthropes were known to return to feeding grounds that had proved fertile in the past. But Mr. Palter had not fed here this night, at least not yet. The proof of it was that one of the Warins' two cows remained standing far to the side of the field, its back toward the tracks in the pasture, which Hal could make out now in the light of the moon. They were as Wife Warin had described, thick and curved as though a heavy body had been dragged over the tall grass, round and round, compressing the blades beneath it as it went. The sorry animal. Hal wandered into the tracks, tracing the path the lycanthrope must have taken. This was strange work for one so bestial in nature. Why not just feed? Perhaps he was fighting his urges even then. A picture of who Cathar Palter was began to form in Hal's mind. He was a good man, a kind man, a man of the church. His intentions, it seemed, were in the right place, even when he was not of his right mind. "I've lost his scent completely." Alena's words brought Hal back to herself. As she joined Alena in a search to pick up the lycanthrope's trail, she reminded herself that intentions were nothing without action. She and Alena would have to kill the werewolf. "Murder! There's been a murder!" Lady Elsa Shoran's voice echoed through the night. "It's the bell-ringer! Oh, poor Orwell is dead!" Then came the ringing of the bell. The rope once again pulled by Lady Elsa herself, no doubt. Alena and Hal wasted no time; before Lady Elsa's voice had ceased echoing, they were moving through the night like two shadows. Concealed in the dark alcoves, they closed in on the press of townsfolk who had gathered round the bell. 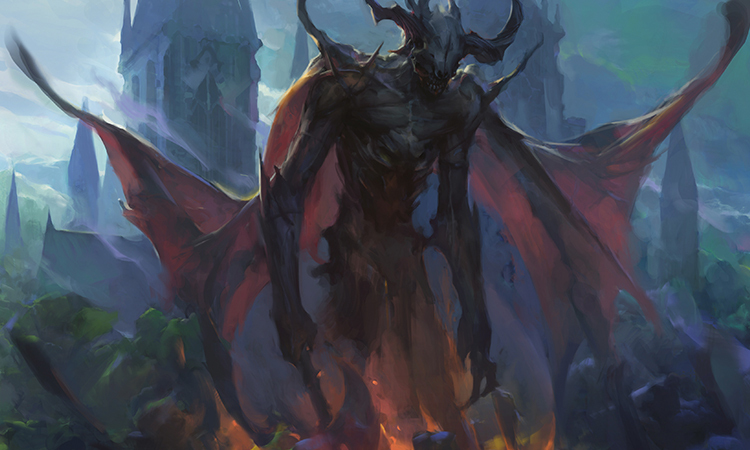 Careful, silent posturing allowed them to see through the mass of shoulders and necks to the pool of dark blood on the ground at the base of the bell tower. There was no mistaking the pattern. This was the work of Mr. Palter. The lycanthrope had killed again. As though in confirmation of Hal's conclusion, a howl sounded from the Ulvenwald. Without a word, Hal and Alena took flight toward the woods. But before they were out of sight of the square, Hal glanced back over her shoulder. Something about the scene niggled at the back of her mind. However, there was no time to wonder what it was. She turned back toward the trees; they were on the hunt. Entering the wood through the Warins' farm, it was easy to pick up the large, lupine tracks again. They followed the trail past the point where it diverged, this time moving west, deeper into the forest. Hal realized where they were headed: the henge of old Avabruck, the lost capital. It was a place of geists and werewolf scavengers. Perhaps they would face more foes than just the one they were pursuing. 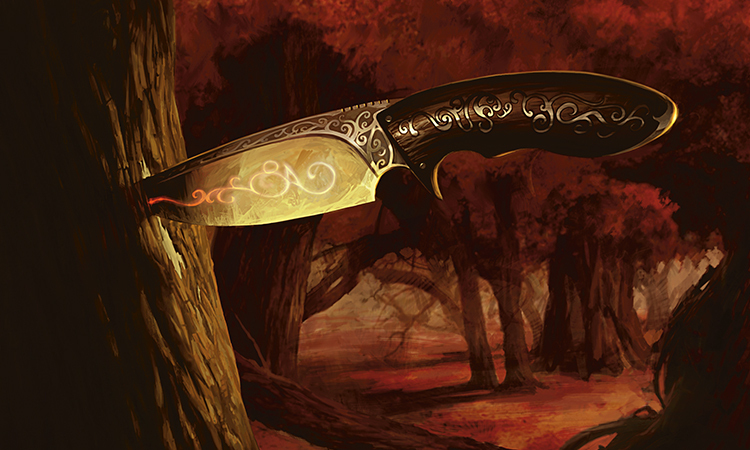 As she ran, Hal touched the hilt of her favorite dagger, ready to defend her woods. Suddenly, Alena held up her hand and ground to a halt. Hal nearly trampled her, but managed to stop just before colliding, her eyes on the sight that had given Alena pause. There before them on the forest floor was the body of the bell-ringer. Orwell was ghostly white, his skin withered for lack of blood in his body—a body that was for the most part intact. His limbs were splayed out as though they had been carefully arranged. And all around him the underbrush and grass had been tromped down as though something heavy had been dragged over it. Something was not right. There should not be a body. The beast should have fed. Senses on high alert, Hal and Alena stalked the scene, Alena at the perimeter and Hal along the path of dragging. She knew it before she paced it out—the shape of it, the look of the curves, it was the same shape as the marks in the pasture at the Warins' farm. This made no sense. Was this the result of some sort of ritual? Was this tracing of a pattern something Mr. Palter did to resist the urge to consume? What kind of lycanthrope were they dealing with? Hal looked to Alena to ask that very question, but Alena's eyes were glued to a place further on into the woods, barely lit by the light of the moon. Hal followed Alena's gaze and saw it too: a second body. When they approached, they found that the same that had been done to the bell-ringer had been done to the ward-maker, Lady Evelin, appendages splayed, grass beat down. And just beyond was the body of Elder Somlon. Again, the same pattern in the grass, the same arrangement of the arms and legs. "Elder Somlon was to have been—" Hal began. "Seeing to death rites." Alena finished. "But then, she must never have been given the chance. Look." Hal pointed to a detail that made her hand tremble. It was the lace of Elder Somlon's blouse. It matched the bit of lace that had been left behind in the Palters' room at the inn. And there, at the cuff of the Elder's sleeve, they could see the gap where the bit they found would have fit. "If Elder Somlon was the victim at the inn," Alena said. "If that was her blood," Hal added. "Then what of Mrs. Palter?" The crawling feeling returned to Hal, this time running straight up from her tailbone to the top of her skull. The shiver that passed through her was augmented by the vibrations of the howl that rang out at that very moment in the night. "And what of Mr. Palter?" Hal asked. "I believe it's time to find out," Alena said. She darted off in the direction of the howl and Hal followed. As they ran, Hal noticed that they were moving parallel to another's trail. She adjusted her heading to align herself with the tracks. They were boot prints. Mr. Palter's boot prints? Something in Hal's mind clicked. "What is it, Hal?" Even through the trees, even at a sprint, Alena had sensed the shift in Hal. "The moment of transformation." Hal's mind was racing along with her feet, putting together pieces, struggling to find an answer to a question that she didn't know how to ask. "If it happened there," she panted, "back in the woods—"
"It did," Alena said between heavy breaths. "We both saw the proof of it. His human prints and then the lupine ones." "No." Hal shook her head. "We saw boot prints. And we saw paw prints. Separately." "But if they were from the same feet," Hal went on, "then where were the boots themselves?" Alena slowed in her gait, almost imperceptibly, but Hal noticed it; she had the girl's attention. Hal pointed to the ground at her feet. "And why do we see boot prints again here?" Alena stared at the ground as they ran, taking in the sight of the boot prints. "What if," Hal began when she believed Alena to have had enough time to put the pieces together herself. "It is not Mr. Palter?" Alena finished. "What if the lycanthrope is—" Mrs. Palter's name was caught on Hal's lips because in the moment she was about to speak it, they had crested a hill, from the top of which they were able to see a small clearing. And in that clearing there was what looked to be a makeshift altar made of twisted stone. The altar was uneven and poorly constructed, and atop it lay the good Cathar Palter. Standing behind him, her hood pulled down over her face, as it was when they had met her for the first time in this woods, was Mrs. Palter. Her arms were raised above the body of her husband, and she was chanting. It was demonic chanting. Hal recognized the intonations and deep guttural sounds. "Ormendahl. Ormendahl! ORMENDAHL!" The name was clear. This woman was in contract with a horror. "Bes, please." Hal's heart lifted upon hearing the weak voice. Good Cathar Palter was still alive! "Be silent!" His wife spat. She drew a blade. Hal and Alena both lurched forward, racing toward the small clearing. Mrs. Palter looked up at the sound of their approach, but only in time to glimpse their forms as they tackled her to the ground. Though her body bucked and her arms thrashed with more strength that Hal had previously given her credit for, they managed to hold her pinned. Alena drew her own blade. "No!" Cathar Palter cried from atop the altar. "Don't hurt her!" Hal glanced up at him. "She was trying to kill you." "Let her go. Please. She doesn't know. Oh, she doesn't know what she's doing." "It was her, wasn't it?" Alena asked, holding her blade to Mrs. Palter's neck. "She killed them. All of them." The cathar did not deny it. "The blood in your room at the inn that morning, that was Elder Somlon's blood, wasn't it? You knew what she was capable of when you left Gavony, when you brought her to Gatstaf. You tried to bind her, in the closet, but the straps could not hold the evil that possesses her." Alena offered one damning truth after another. "And then she got out. She tried to kill at the Warins' farm; she etched her demonic markings into the ground, but you stopped her. However, after that, you lost control. You followed her around the town, unable and unwilling to stop her from collecting her victims, so instead you brought them here. To hide them, to hide her. One after another, you moved the bodies. Three bodies, Mr. Palter. She killed three innocents." "It's my fault!" Cathar Palter wailed. "It's all my fault! The mausoleum was under my guard. Whatever emerged from it that night, I could have stopped it." Hal doubted that very much. The demon's name, Ormendahl, she had heard it before. And from the stories she knew of it, it was not a demon that a single mausoleum guard, no matter how good-hearted and well-intentioned, could have stopped. For the third time that night, her heart went out to Mr. Palter. But her sympathy for him was not enough for her to consider letting Mrs. Palter free, for the woman was lost; what was left writhing under Hal and Alena's grip was not Mr. Palter's wife. That would be an impossible thing for him to understand. Hal nodded to Alena, who readied to plunge her blade. But just then, Mr. Palter half-fell, half-launched himself off the altar, his body crashing into Hal and Alena. In that instant, their shared grip was loosened just enough for the cursed woman to free herself. Mrs. Palter leapt to her feet, and Hal could feel the power collecting within the slender waif of a woman. Then Mrs. Palter opened her mouth wide and roared down at Hal and Alena. The sound was not unlike a werewolf's howling. Something gripped Hal's mind as she and Alena sprang for the woman. What about the werewolf? The pieces still didn't fit. The tracks in the forest—they had seen clear lupine prints. The cow that had been devoured—properly devoured with the bones and teeth left behind. That was not Mrs. Palter's doing, was it? Hal's contemplations caused her to miss a swift, dodging movement from Mrs. Palter that she would have easily countered had she been entirely focused on the brawl at hand. Mrs. Palter moved more swiftly than she should have been able to, and before Hal could compensate for her lapsed attention, Mrs. Palter dove out of her reach and in one motion tackled and stabbed her husband through the chest. Hal and Alena were on her before she could pull the knife out to stab again, but the damage was already done. The fading gurgling from the good cathar confirmed it. It was nearly impossible to hold Mrs. Palter to the ground. So powerful were each of her movements, fueled by her demonic contract, that it took the two of them to hold back just one arm. But Hal and Alena were well-practiced; it was much like grappling a moldgraf monstrosity, and now Hal had turned all of her attention to the physical battle. Though Mrs. Palter fought with all her might to stand, all she was able to succeed in doing was to lift her head. As she did, her hood fell off. For the first time since they had met her in the woods, Hal and Alena looked upon Mrs. Palter's face. So disfigured was it by the power of the demon that had coursed through her time and again, so appalling was the molted flesh, that Hal cried out. Mrs. Palter smiled. Then she began to chant, and as she did, her irises changed from pale blue to dark, glistening black. The black spread quickly to fill the entirety of her eyes. Hal looked to Alena, who was struggling as much as she just to hold Mrs. Palter down. There was nothing they could do when the woman called upon the enormous amount of demonic power she had summoned and threw them off her. Hal shot through the air until her side smacked into the thick trunk of a tree. Pain radiated out from her shoulder and the side of her head as she collapsed to the ground. She struggled to get up, to force her limbs to move the way she wanted them to, to compel her vision to focus from three panels to one. The pain in the side of her head was like a blade that was rammed through the whole of her body, pushing her down. But she could not let it, she would not, for she could see there before her, Alena, falling to one blow after another from Mrs. Palter's thrashing fists. Though Alena jumped up every time, she was no match for the well of strength that seemed to be endlessly flowing through the cursed woman. And then Mrs. Palter reached for her blade. "No." Hal's cry, though fed by her desperation, barely made a sound. She fought against the weakness in her limbs, pushing herself to her feet. But she was not fast enough. Mrs. Palter's blade came down. Hal's strangled scream was never heard because it was overwhelmed by the sound of a lycanthrope's snarl. Mrs. Palter's blade was stopped, and the woman was thrown to the ground by the single swipe of a wolf's forelimb. Her blood flew everywhere, whipping off the teeth and claws of the giant beast. Alena rolled away from the fray, and Hal was at her side in an instant. Together they plunged their blades into Mrs. Palter's raging, bloody form. As the demonic curse drained from the woman's lifeless limbs, her body deflated, and wilted to the ground at their feet. This left Hal and Alena standing shoulder to shoulder, face to face with a massive, panting lycanthrope. Before they could act, before they could even communicate their intentions to each other, there was a snarl from the trees to their left. And then one from their right. One behind, two in front. Then all around them they saw glowing yellow eyes, reflecting and tarnishing the light of the silver moon. They were surrounded. How many were there? A dozen, perhaps two. Hal felt Alena tense. This was not Alena's usual firm, grounding stance; the girl was rigid, strained. Hal raised her bloodied dagger, locking eyes with the biggest of the lycanthropes, the one standing before them. If they were to die here tonight, it would not be without a fight. But even as she prepared to strike, the lycanthrope changed its form. It happened so quickly that Hal barely registered it. Suddenly the beast was a human woman, one with hard lines and a striking figure. The silver moon shone off the woman's pale skin and glistened off the white tips of her long hair. Never before had Hal seen a lycanthrope turn back to human form in the heat of battle. Never. It was impossible. Yet here it had happened. For a moment none of the three of them moved. Then Hal held up her dagger and very slowly, keeping eye contract with the woman, set it on the ground. Alena shifted and cast a questioning look at Hal, but registering Hal's certainty, she proceeded to do the same. Hal thought she saw a very slight nod from the naked woman before them, and then the woman turned to the rest of the surrounding pack, all of them breathing heavy, battle ready, hungry. The woman shook her head once, short and sharp. A whimper sounded in response, just one, and then the pack turned and disappeared into the trees of the Ulvenwald. Hal and Alena were left alone with the woman who had just saved their lives. Hal cleared her throat. She was going to say thank you, but the words would not come. Instead, she unbuttoned her outer coat and offered it to the woman. "Thank you." The woman took Hal's coat, shouldering it on. "Thank you," Hal said, finding her voice. "I did not do it for you. I have been tracking her." She nodded to Mrs. Palter. "And others like her. There are too many in our towns." "So it was your tracks," Alena said. "And you who ate the cow." The woman ignored Alena. "If it was not for my desire to end her wretched life, I would not have saved your lives." Hal started at that assertion. "But seeing as you have been left alive," the woman went on, "I will tell you this only once: you must cease your killing of my pack." "If you do not, I will be forced to move against you. And when I do, I will end you." The way the woman said it wasn't as a threat, but as a statement of fact. Hal bristled. "This is our woods. The Ulvenwald is under our protection." 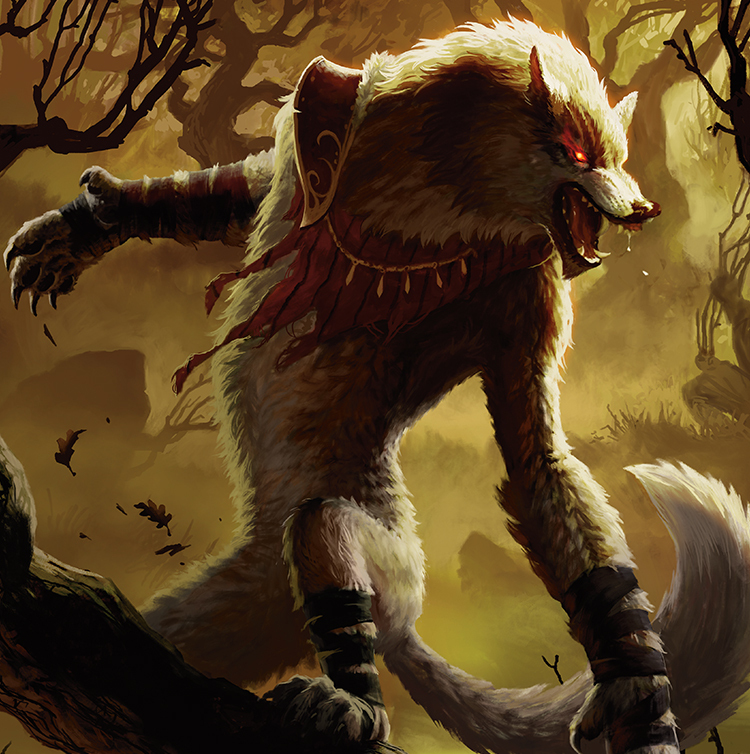 "We cannot allow werewolves in our domain," Alena added. "It is not up to you," the woman said. "And it is foolish of you to think that just the two of you could keep this woods safe from what is coming, foolish to think you can even stay alive here yourselves. Leave the woods, little hunters. Leave the woods to us." "We would never." Alena clenched her hands into fists. "What is coming?" Hal asked, serious. Alena snorted, but Hal was not distracted. There was something about this woman that made Hal heed her words. "I don't know exactly," the woman said. "But," she indicated the altar and Mrs. Palter, "I have seen enough, and so have you, to know that whatever is out there is worse than werewolves. This world will need us soon. It will welcome the sound of our howl, the muscle of our pack. We may be the only force that can stand against whatever it is that is threatening it." 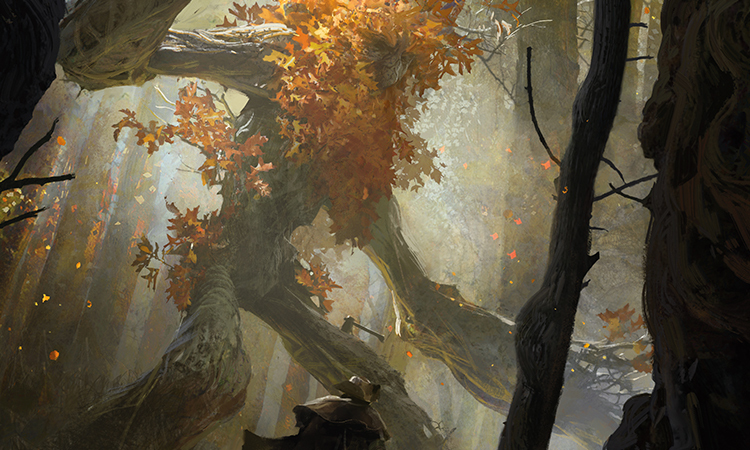 "We will stand against whatever threatens the Ulvenwald," Alena said. "There is nothing we won't face." The woman sighed. "If you stay here, you will face your deaths." She dropped Hal's outer coat from her shoulders. "You did not perish tonight only because I intervened, only because of a werewolf. Consider that. Or don't. It is up to you. But know that I am advising you to leave. Get out of the Ulvenwald, and when you do, stay out. And pray, if that is something you do." "We will not—" Alena began, but the woman had already slipped back into her wolf form. Her transformation was nothing like the usual brutal, bulging transformations that Hal had witnessed in other lycanthropes. This woman was not a usual werewolf. With a final snarl, she turned away from them and glided off into the trees. Hal and Alena were left standing in the filtered moonlight deep in the dark woods. Once more, the crawling sensation returned to Hal, fingers running up her spine. She could not help her body from shuddering. The feeling was not because of the lycanthrope, it was because of something else entirely—something Hal did not yet know or understand. Alena looked to her, daring in her eyes, poised to run, but Hal was unsure of which way they should go. Arlinn Kord darted between the tangled trees. The foolish humans. How could they be so blind? She hoped she would not be forced to kill them one day. They were strong and wild. Characteristics she valued. In another life she might have befriended them. But this was not that life; in this life, Arlinn could not have friends.